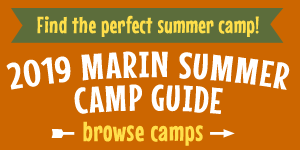 Marin Mommies presents a sponsored article from Camp EDMO™. It seems pretty obvious that little kids benefit from spending structured time at high quality pre-school programs. But let’s get to the nitty gritty—what exactly is it that makes a program good? Is it the giggle-worthiness of the games they play? The sproingy-ness of the playground bouncers? The squishy-ness of the naptime mats? Sure, having the best of everything is nice. But when it comes to Pre-K and Kindergarten aged kids, around ages 4 and 5, what’s really important is who they spend time with and what they do. We know that children’s early relationships and experiences support later development, including their abilities to succeed in school and in life. Just like a foundation strong beams holds up a house, a young child’s initial interactions with the people and places that surround them lay the groundwork a footing to support their entire being. Even before kids get to elementary school, their brains and bodies embark on a lifetime of learning. Today’s experts in early education, like author Erika Christakis, recognize that opportunities to be creative, practice communication and develop social skills are more important than formal, academic education for young children. This thinking is supported by science, too. Berkeley’s Greater Good Science Center references a recent twenty-year study from Duke and Penn State that found children who had better strongerdeveloped social skills in Kindergarten were were more likely to graduate from college and hold full time jobs as adults.more likely to graduate from college and hold full-time jobs. College and full-time jobs are far in the future for today’s Pre-K kids. But any time is the right time to strengthen a foundation that will last a lifetime! One local organization that helps children get ready for school in all the right ways is Camp EDMO™. Their unique blend of STEAM (Science, Tech, Engineering, Art, and Math) and Social Emotional Learning (SEL) encourages kids’ natural inclination to be Curious, fortifies their Courage and expands their Kindness. EDMO™ helps campers build these three character traits with their own STEAM-inspired, maker-infused curriculum and highly trained instructors who cultivate adventure, invention and silliness (yes, really!). It starts with kids entering Pre-K and Kindergarten. While they play, create and make friends, they get used to routines and absorb SEL skills. Whether it’s learning to play collaboratively or express emotions, EDMO Jr. campers flex their growing mind, body and spirit. Then there’s room to grow beyond that! In grades1–2 EDMO Prime, and in grades 3–4 EDMO Max, give campers a platform to experiment, define what they love to do, express emotions and form deeper friendships. Around 5th grade, EDMO Pro campers choose a passion and explore it with deep focus. When campers enter 9th grade they can grow into Leaders-in-Training, with the possibility of becoming paid counselors and staff in the future. The proof is in the pudding for Camp EDMO™, because they hire their own graduates!